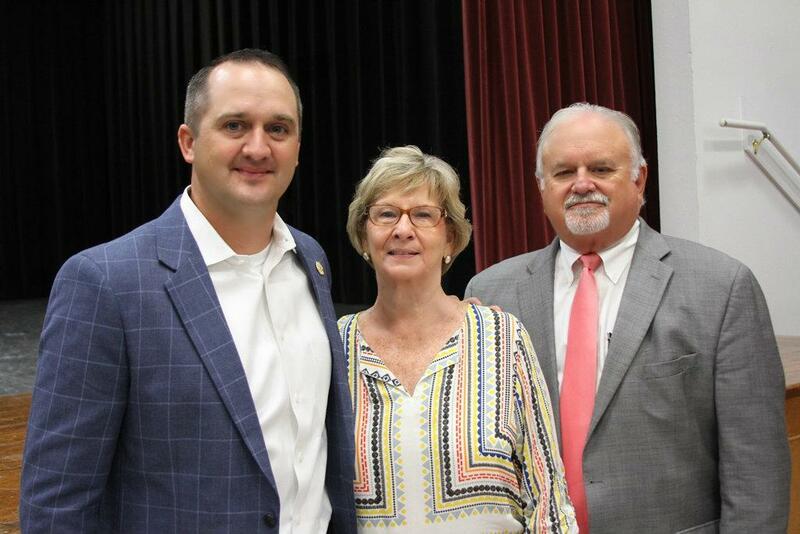 Coldspring-Oakhurst Consolidated Independent School District welcomed back administrators, faculty and staff for the 2018-2019 school year at the District Convocation held on Monday, Aug. 20. Administrators, faculty and staff enjoyed performances by the Trojan Cheerleaders and the Trojanettes drill team, and were led in the pledges by the Coldspring AFJROTC Color Guard. Superintendent Dr. Leland R. Moore opened the morning with good news informing everyone they were getting a raise this year. The COCISD Board of Trustees approved a $1,500 raise for teachers and $1,000 for all other employees, a raise that was much larger than a simple percentage of mid-point would have given. “We made a promise to you and to the tax payers of this district that if the bond passed, our teachers and staff would get a raise and we have kept that promise,” said Dr. Moore. COCISD Board of Trustees President Barbara Moore welcomed everyone back and encouraged the group to be steadfast in the important roles they all play in the education process. “You, as teachers and as staff, can make all students feel like they belong and are valued,” said Moore as she thanked them for their hard work and dedication. Guest Speaker State Representative Ernest Bailes discussed the upcoming legislative session and the challenges that would be faced by lawmakers, as well as the new Texas Education Agency (TEA) A-F rating system. A system he said was designed to put a focus on underperforming schools in the interest of special groups that stand to profit from a failed public education system.